Drück Glück - Read this review before registering! 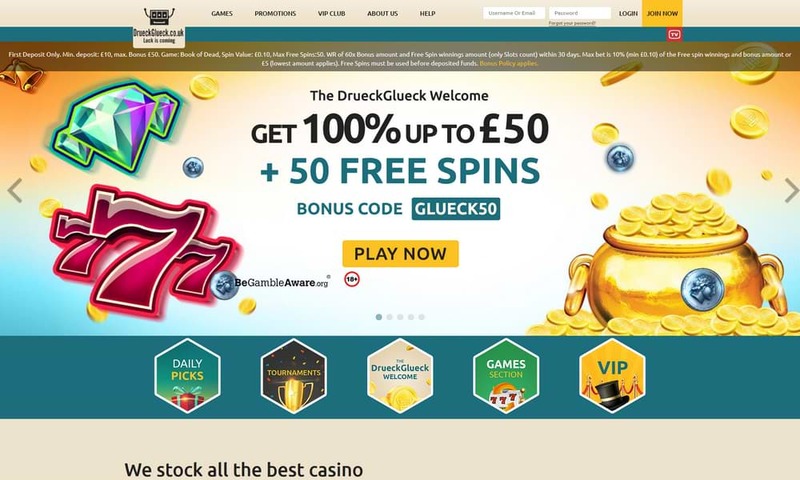 Drück Glück (meaning "click luck") online casino is a relatively young website, which was first established in 2015. However, the operator has managed to gain a lot of popularity, especially with their fantastic bonuses, fair payments and great game selection. The casino offers the games from many different game developers, among them Netent, Microgaming WMS, Merkur, NextGen Gaming and Evolution Gaming. There are hundreds of games available, many of which can also be played on mobile devices. The casino supports iOS and Android devices and delivers a fantastic gaming experience. Find out what the casino has to offer in our review about it! The Drück Glück casino currently offers the games from the following developers: 2By2 Gaming, Amaya, Aristocrat, Bally, Barcrest, Blueprint, GDM, GVG, Just for the Win, Lightning Box, Merkur, Microgaming, Nyx Gaming, Netent, NextGen Gaming, Real Time Gaming, Shuffle Master, Williams Interactive. The game selection is also regularly updated, and you can expect new games every week. You can find a huge selection of almost 600 slot machines that includes some of the most popular titles, such as Starburst, Jungle Spirit, Golden, Legend of the Pharaohs, Double Triple Chance, Vampires, Hot Wheels, Jungle Jim El Dorado, Eye of Horus, and many others. Some of these games also have huge progressive jackpots. The selection of table games includes roulettes in different versions, as well as card games, such as blackjack and video poker games. You can also play live games against real dealers in the live casino. Available games are Roulette, blackjack and different casino poker games. The casino offers access to the live casinos of Evolution Gaming and Extreme Gaming. The welcome bonus at Drück Glück is currently 100% up to €100 and 25 free spins. You can receive the bonus for your first deposit, and you need to enter the bonus code Glueck when making the deposit. The free spins can be played with either Starburst, Jack and the Beanstalk or Gonzo's Quest. The minimum deposit to receive the bonus is €/£/$ 20, and it has wagering requirements of 30x the bonus, which is relatively low compared to other casinos. Winnings from free spins are wager free and credited as real money. Before playing with bonus money we suggest you read the terms and conditions carefully, and also look at game contributions. Slot games and scratchcards contribute 100% to wagering, but other games contribute much less. You can find more details in the bonus terms. The casino also has many other promotions available, among them are free spins, monthly bonuses and slots tournaments where you can win some extra cash. The casino also has a loyalty program that rewards loyal players. You have several stages from Bronze to Red Diamond, and you will climb up the ladder depending on how much you play the games. When playing the games you will collect VIP bonus points that determine your VIP level. Being a VIP player at the casino has certain perks, such as a personal account manager, exclusive rewards and special gifts. Drück Glück online casinos is operated with licenses from the German state of Schleswig-Holstein, Denmark, Malta and the UK. Those licenses ensure that the operator follows strict regulations when it comes to player protection, and they are regularly audited for compliance. You can be certain to be in good hands when playing here. The website is available in English and German, although Germany is their main target market. The website also uses encrypted connections, and your transactions are secured through SSL. You can also be certain that the casino will not disclose any of your personal information to unauthorised third parties. The casino accepts many different payment methods, and you can deposit with credit cards, electronic wallets, vouchers or instant bank transfer. Withdrawals are usually processed on the same day, but it can take up to 3 days for the payments to be processed by the casino, which also depends on whether or not the player account has been verified yet. When you request a withdrawal the same method is used that was used for the deposit, unless this is not possible. Before the withdrawal is processed you can also cancel it and the money will be credited back to your player account. This support is available 24 hours, 7 days a week, and you can contact them by phone, e-mail or live chat. The casino Drück Glück convinces with a solid reputation, and many users value the seriousness and professionalism of the casino. The game selection is large enough to make most players happy, and you can find many games from well-known developers, but also smaller studios that are not widely available. Although the payment speed is a little slow, you can be certain to receive your money without much fuss from the casino. Overall, the reputation of the casino is well-deserved, and it is worth taking a look. Rip offs!!!! !They won't pay out my money (5000) because I exceeded a £3 spin! Tried to withdraw my money for days and spoke to many people via live chat and emails and it wasn't a problem until I checked my bank and saw they had cancelled my 5k withdrawal and put £100 instead! They won't pay out and have caused me great stress! Stay away from this casino and sister sites!!! !